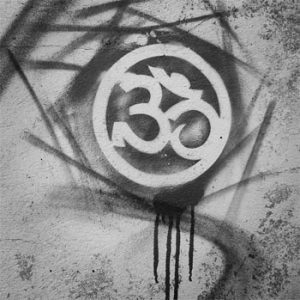 Om is a vibrational mantra that mirrors the universal pulse since the start of time. It seems that ancient yogis already understood what scientists know today….that the entire universe and everything within it is energy in a constant state of motion. Moving all the time. Everything vibrates, pulsates, rotates and quivers on a micro and macro level, creating a rhythmic cycle of vibration. The heat and light of the suns rays, the ebb and flow of the tides, our beating hearts, the changing seasons, our voice, our sight, our essence all generated from vibrations of wave-like frequency and ……. Those clever old Yogis acknowledged all this with the resonating sound of Om. Einstein articulated it like E=MC2. Meaning energy cannot be created or destroyed merely varying in a constant flux and motion. Mantras are sound vibrations that resonate with the mind replacing your usual crazy mind patterns while you chant or listen in other words deeply calming. Perhaps even rattling the subconscious into making you think, do or say things that contribute to the sentiment of the mantra. It means literally – “May all beings be happy and free” “Puissent tous les etres de tous les mondes etre heureux”. Listen to or chant along to this sweet sanskrit mantra and you might find yourself becoming more loving, compassionate, liberating, kind… Happy days. Why listen to or make the sound OM? The essence of the sound ‘OM’ is a reminder that the only constant in life is change. It should challenges us to find a steadiness from which we can adapt, grow, learn and ride the waves of life. Feel the resonance! Embrace the universal concept of vibration and constant movement, sense a bigger connection. You don’t need to be a buddhist monk to get your vibe Om.